This elegant California-Mediterranean-style estate is adorned with transitional interiors and offers panoramic ocean, Catalina, coastline and city light views. Designed by EBTA Architects, the stunning estate is accentuated by soaring ceilings made possible by a unique 35-foot height allowance. Volume and light flood the interiors, affording ample opportunity to relish in the homeâ&#x20AC;&#x2122;s extraordinary details. The magnificent great room blends seamlessly with the outdoor loggia through a large set of remote-controlled pocket doors. The gourmet kitchen features two islands with bar seating and professionalgrade appliances, while the formal living and dining rooms feature stunning coffered ceilings. Warm contemporary. Recently re-built. Enjoy breathtaking ocean views year round. In-ground oceanfront spa. Gourmet kitchen. Great room with disappearing glass doors. Impressive game room. Glass wine room. Ocean view balcony and patio. This beautiful home is only one block to the beach on Coronado Island. It is a Richard Requa masterpiece historical designation. This stunning Crystal Cove estate residence is nothing short of perfect, blending the romance of Spanish architecture with the timeless appeal of traditional interiors with spectacular ocean views. Set on a spacious, gated lot with lush landscaping, the home and guest house enjoy the luxury of privacy. The estate encompasses 8,000 SF and 5 bedrooms, 5.5 baths, with finishes and amenities hand-selected for beauty and quality. Positioned on a 22,500 SF lot and designed to maximize the front-row views of the Pacific, coastline, whitewater and Catalina. Elevated 140+ feet of amazing oceanfront living with a rare bluff-top pool and spa! Ocean views from most main living areas. 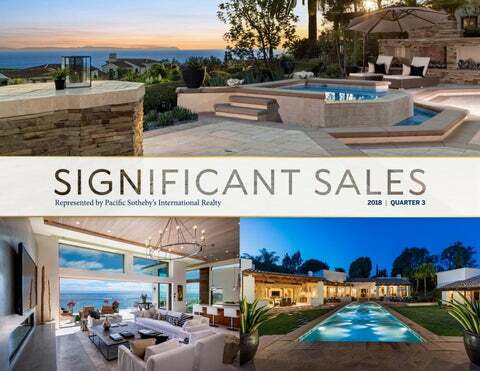 Experience La Jolla indoor/outdoor living in this 5,800 SF remodeled custom estate. Gourmet kitchen and built-in high-end appliances. Two master suites, both on the main floor and upstairs. Custom home theater. Be mesmerized by the sounds, surfs and sunsets year-round. Newly constructed modern estate awaiting your arrival! Refined modern ranch living at its finest. Located in Rancho Santa Feâ&#x20AC;&#x2122;s prestigious Covenant, conveniently close to the village. This brand-new Richard & Kyle Doan masterpiece, creatively crafted, will take your breath away. Mark Radford Architecture designed with open single-level floor plan and incredible outdoor luxury living. Views and sunrises that you will never forget! “Summer House” The ultimate expression of Southern California living is defined in this brand-new Greg Agee 2018 custom construction. Sitting above the signature thirteenth hole of the famed Rancho Santa Fe Golf Course, named by Golf Digest as one of the top 20 golfing venues, Summer House is the perfect balance of classic and casual. The stunning single-level estate offers sweeping views above the Covenant golf course, while at the same time you’ll enjoy total privacy. One-of-a-kind, brand-new Huntington Harbour home on an over 10,000 SF lot. 100-foot dock and pool in the 24-hour guard-gated Coral Cay community. One of the very best homesites. Enjoy this oceanfront luxury estate with distinctive and breathtaking views. This home is well designed and sophisticated with endless blue water views. Listen to the sounds of the waves for the perfect ambience. As you enter the property through the gated courtyard, you are immediately welcomed by the fresh scent of the ocean air. A casual floor plan featuring a pocket door system, leading to the large outdoor lanai that is perfect for entertaining. This prime coastal parcel has direct beachfront access. A rare opportunity to live on the California coastline. This majestic European estate is approximately 300 yards from La Jolla beaches famous for great surfing, kayaking, swimming and strolling. Situated on one of the largest private lots in the community. The home consists of elegant interiordesigned living space. High ceilings and cantina-style doors accommodate enjoyable indoor/outdoor living. The home is luxuriously set on a nearly half an acre of flat usable land, with palm tree-lined, manicured grounds providing the ideal setting for entertaining. The back yard features a resort-style outdoor oasis with a large pool, outdoor fireplace, fire pit, entertaining bar and more. A rare opportunity to own one of the Montage Villas featuring an eminently livable floor plan with three en-suite bedrooms. The kitchen offers beautiful cabinetry, granite and marble, and large island. French doors from the great room open to a covered patio with spa and ocean views. The master bedroom is your private getaway with sitting area, romantic fireplace and spa-like bath with jetted tub and steam shower. Homeowners enjoy close proximity to the world-renowned Montage and all its amenities, including the Spa Montage, Mosaic Pool, and dining at The Loft and Studio. Strategically positioned to capture expansive views, this stunning single-level 6-bedroom estate is embraced by a magnificent 3.5-acre cul-de-sac homesite in the exclusive Covenant. Enjoy a detached guest house, luxe master suite, and a view-oriented heated indoor/outdoor loggia with a fireplace and a BBQ station. A gym, updated bathrooms, and walnut and stone flooring are recent additions. Outdoor enhancements are led by a putting green, volleyball/sport court, fruit orchard, and a vanishing-edge pool and spa. The most critical and extremely rare amenity is the estateâ&#x20AC;&#x2122;s connection to underground high-speed internet and the addition of a whole-home solar system. You wonâ&#x20AC;&#x2122;t find more stunning ocean views than at this luxury property. Rich, earthy and emanating natural light, this multilevel home embodies these ethereal qualities. The 4-story hillside estate is situated in a premier location in a charming, tree-lined neighborhood. It offers lush landscape, well-manicured and low-maintenance grounds, and a private pool. The home showcases extra-high ceilings on the main level with an open floor plan, featuring a gourmet kitchen, a large living/ family room, gorgeous stone floors, and the piece de rĂŠsistance, those unending, unobstructed views of the Pacific. Experience ultra-modern oceanfront living in Capistrano Beachâ&#x20AC;&#x2122;s guard-gated enclave, complete with views of sunsets, city lights, and Catalina Island. With captivating modern architecture that mimics the waves, this home highlights floor-toceiling glass and an elevator servicing all floors including the amazing roof-top deck for breathtaking panoramic 360-degree views. The stylish kitchen with ocean views features state-of-the-art appliances to make the most discriminating chef feel right at home. The exceptional home offers privacy, 24-hour security and a one-of-a-kind location. Experience luxe Crystal Cove living at its finest in this recently-renovated, Santa Barbara-inspired residence offering expansive sit-down views encompassing the sparkling Pacific Ocean, San Clemente and Catalina islands, and year-round sunsets. Comprised of nearly 3,900 square feet, this highly sought-after, open-concept plan offers 4 spacious bedrooms, including a desirable ground-floor master suite and detached guest casita, home office with soaring, two-story ceilings, upstairs bonus room & a gourmet kitchen that melds seamlessly with the inviting dining room and generous family room. A classic, shingled oceanfront beach home that is reminiscent of those found along the Hamptons shoreline. With sun-filled rooms and panoramic whitewater views this charming, traditional three bedroom Balboa home sits along the oceanfront strand and captures sunset vistas behind Catalina. An incredibly rare opportunity to own one of the best view homes in all of Newport Beach. The home spans 10,068 square feet, on a sprawling 22,500-square-foot lot which showcases stunning panoramic views from the mountains to the ocean, up the coast to Los Angeles. The main home boasts five spacious bedrooms and six baths, with ample social space, opening to the rear yard where a pool and accompanying one-bed, one-bath pool house offer entertaining spaces overlooking the magnificent views. Making this incredible property even more unique is the opportunity to customize the home. A spectacular estate in the prestigious gated community of Shady Canyon. This 8,539-square-foot home is on one of Shady Canyonâ&#x20AC;&#x2122;s most picturesque and secluded custom lots, with almost 38,507 square feet, and features five elegant bedrooms, seven baths, a home office and game room. Offering sprawling vistas and mountain views, this architectural masterpiece was built to transcend time and become a lasting legacy estate with unparalleled craftsmanship. Simply the best unit in the Shores, in the finest tower, La Perla! Perched on the fourth floor, overlooking the ocean. Fulllength windows to savor the incredible coastal view! Contemporary open design, the largest floor plan in the Shores, 3 bedrooms, 3.5 bathooms and 3,250 SF. Finely designed, incredible craftsmanship and quality finishes throughout. The corner location with its breathtaking ocean views is extraordinary. Triplex on 75 foot ocean frontage. Tear down or rebuild on this R3 Lot. One of the largest ocean frontage properties. Currently used as four units, two-car garage and off-street parking. Elegance, adventure and privacy await in this newly remodeled 40+ acre private estate perched above The Heritage. Part unparalleled luxury residence, part magical playground, and part wondrous panorama â&#x20AC;&#x201C; this luxury estate takes your breath away. Property features flawless interior/exterior design, stunning craftsmanship and ideal flow. Equestrian amenities include stylish barn with four horse stalls, groomâ&#x20AC;&#x2122;s quarters, and riding pen. Exceptional backyard with sport court, baseball cages, pool, spa, waterfall, loggia, stone patio, outdoor kitchen and room to add more outdoor offerings. Savor the rewards of a preferred oceanfront lifestyle in this grand 3,908-square-foot, three-bedroom, and threebath home behind the guarded gates of Capistrano Beachâ&#x20AC;&#x2122;s highly coveted Beach Road neighborhood. Unobstructed views of the ocean, beach and graceful dolphins provide an unmatched setting for harmonious beach living. Your luxurious master suite offers an ocean-view deck, sitting area with fireplace, and a lavish master bath. Offering a generous Trex-finished deck on the sand with direct beach access, ownership of the private beach up to the median high-tide line is included and extremely rare in California. Impeccably-maintained, custom-built, single-level estate on 3.68 tranquil acres with direct Covenant trail access and fabulous indoor/outdoor living spaces. Gorgeous grounds with gated entry and long, private driveway. Resort-style living with a fully fenced, southern exposure yard complete with fragrant citrus groves and gardens, tennis court and detached guest home. Centrally located close to the village, Rancho Santa Fe school, the club, tennis, equestrian trails and across the street from the highly acclaimed Rancho Santa Fe Golf Course. Enjoy the natural beauty, an idyllic village and a country club lifestyle in this private 2-acre golf course estate that hosts this exclusive enclaveâ&#x20AC;&#x2122;s ultimate, walk-to-everything location. Local school, village, shops, restaurants, golf club, tennis club and equestrian trail are all immediately accessible from the back yard! The main residence features 5 ensuite bedrooms, a bonus room, indoor and outdoor family rooms with fireplaces and media centers, and a stunning one-bedroom, one-bath en-suite guest house with a living room and kitchenette. Landscaped grounds include a lavish pool and spa surrounded by expansive lawn and towering trees that frame the panoramic golf course view. Stunning single-level Santaluz home offering breathtaking indoor and outdoor living with the best panoramic views to the ocean. Outdoor California living room with a gorgeous sunken bar. The vanishing-edge pool and spa includes a trickling waterfall, mini bridge you can swim under and a built-in fire pit. Spectacular master suite with a private indoor and outdoor spa that includes a sauna, steam shower, hot tub and cold plunge. Custom bar and media room with 8 professional theater-style seats. The home also boasts three bedrooms, all of which have its own full bath and walk-in closet. Outdoor garden surrounded by lush landscape including lemon, lime, grapefruit and tangerine trees. Premier elevated lot on the RSF Golf Course with unobstructed views of three separate holes at the end of a quiet cul-de-sac. This sophisticated contemporary home was completely rebuilt in 2014 and designed to maximize the extraordinary setting, offering indoor outdoor living at its best. Three separate buildings comprise 8,000 SF under roof, including a newly built spectacular 1,000 SF pool house/living room overlooking the golf course. The main house includes 5 bedroom suites with new high-end finishes and fixtures. A very exclusive opportunity to own 80 feet of bay frontage. Views of the San Diego city skyline and the San Diego Bay. A huge outdoor living space with spa and outdoor bar. This unique design opens to the bay front and has incredible views from almost every room on the first level including the spacious master bedroom suite. The lower level has three bedrooms, 3 bathrooms and a den with a 3+ car garage. This contemporary and zen-like estate is superbly positioned on over a half-acre private canyon lot and masterfully designed by renowned architect Don Edson. This home is great for entertaining and includes a true chefâ&#x20AC;&#x2122;s kitchen with high-end appliances, multiple fireplaces, elevator, 4-car garage, five spacious bedrooms, four full and two half baths which are all blended effortlessly into 6,242 estimated square feet. Additional features include exotic stonework, custom flooring, limitless windows and multiple outdoor lanais that spill out onto the lush gardens. This is true comfort and refinement. This private and pristine coastal luxury home sits on a usable half-acre lot. Conveniently located only 5 minutes from both the beach and La Jolla Village. Newly constructed, this gorgeous residence offers incredible craftsmanship and elegant custom finishes throughout. The open flow of the home allows for interactive living and entertaining. Bi-folding doors off the kitchen and living room leads to the covered patio and expansive lush backyard. Ocean and sunset views from the second story and roof deck. Breathtaking front-and-center golf course views impress residents and guests alike immediately upon entering this extraordinary custom estate beyond the guarded entry gates of The Bridges. The fairway panoramas and an ideal southern exposure provide a stunning backdrop for entertaining in a backyard that showcases a vanishingedge pool and spa and a wrap-around loggia with outdoor kitchen and pizza oven. The Bridges, a highly sought-after guard-gated golf and tennis community, has been the neighborhood of choice for a peaceful, private, quiet and prestigious environment. This magnificent custom-built view-oriented estate sits above the 9th fairway, allowing commanding views of the clubhouse, lake and vineyard. The predominantly single-level design offers a great room-oriented floorplan, luxurious main-floor master suite, separate casita, office/ library, and a formal dining room. The airy design opens to a backyard loggia, which is warmed by a fireplace and welcomes captivating views. Introducing a sophisticated and modern waterfront masterpiece. Newly rebuilt in 2006 with great attention to quality and details, the light and bright open floor plan seamlessly joins the inside living areas with the outside entertaining patio. Notable features include glass corner windows, floor-to-ceiling bi-fold doors, chefâ&#x20AC;&#x2122;s kitchen and one bedroom/bathroom downstairs, an expansive media/family room with viewing deck and upstairs laundry room. Enjoy boating, kayaking, paddle boarding, and swimming from your sandy beach fronting your property. Just a block to La Jolla Shores Beach and Kellogg Park, in the Shores Village with easy freeway access. This exceptional residence offers a superb great room design, combining a high-ceilinged living room, fantastic modern, open kitchen, and dining that opens seamlessly to an extremely private patio with built-in barbecue, dining area, fire pit and spa. The upstairs master offers peek sea views while a rooftop deck enjoys dazzling panoramic whitewater sea views to La Jolla Cove and Scripps Pier. Amazing luxury penthouse located directly across from the famous Windansea beach. This corner-unit has the largest floor plan with 2,059 SF, three large bedrooms and three bathrooms. It features sit-down whitewater views, and a wrap around terrace that seemlessly extends the living room space, creating the perfect setting for gatherings and entertainment. All of the bedrooms in this condo have views, including two rooms with ocean views. European elegance abounds in this palatial estate high on the hill with panoramic views to the west. Gated with privacy and security, this single-level main house boasts four bedrooms, five bathrooms, soaring ceilings, marble, travertine, granite, chefâ&#x20AC;&#x2122;s kitchen, infinity-edge pool, builtin BBQ and even a pizza oven! It features a two-bedroom detached guest house, room for numerous vehicles, and direct access to tennis courts from the backyard. Located within the coveted Rancho Santa Fe School District, this incredible home offers luscious landscaping with majestic palms and groves giving a sense of tranquility and privacy, while also offering lots of space for entertaining. Contemporary Farmhouse architectural delight. Features include a main house with two bedrooms and en suite baths plus an office on the first level, and a guesthouse with en suite bath and gourmet eat-in kitchen on the second level. The gourmet kitchen features Wolf appliances, a hand-blown glass crystal chandelier graces the dining room and contemporary fireplace warms the family room. Open structural trussed ceilings, skylights, staircase with wood and modern glass rails, vintage wood flooring and a shared outdoor entertaining deck are highlights of this unique home. Gorgeous brand-new construction single-level in Olivenhain on a large lot with expansive views. Four bedrooms, 6 bathrooms, office, formal dining and impressive living room. Beautiful master retreat boasting views, a fireplace, walk-in closet and a spa-like master bath with double shower heads and soaking tub. Salt water pool and spa with its own outdoor bath. Located in a secure gated community close to shopping, great schools and five miles from the beach. Nestled between The Crosby Estates, Fairbanks Ranch and Santaluz and is the peaceful community of Artesian Ridge Estates. This newly constructed single-story custom estate has five ensuite bedrooms and a detached two-bedroom guest house, all on two acres of land. The pocketing doors in the great room open to the large covered loggia and infinity edge pool, spa and large grassy yard with room for tennis courts. A peaceful and serene area of San Diego just minutes to shopping, dining and entertainment and 7 miles to the beach. Pacific Gate by Bosa is a collection of new, luxury condo residences in Downtown San Diego and its iconic design is a fitting addition to the area’s continually transforming and vibrant scene. A landmark designed to reflect the fluid forms of the shoreline, Pacific Gate offers more than just a place to call home. Its innovative architecture defines each residence as one of the most stunning and revolutionary developments in San Diego real estate. Pacific Gate offers flawless finishes and unparalleled services and amenities – not before seen in San Diego – all designed to bring the extraordinary to day-to-day living. Located in Bayshores, a private bay and beach resort lifestyle enclave of 247 homes, this Caribbean influenced home is the perfect setting for the relaxed coastal lifestyle. The island styling includes Bermuda shutters, bamboo flooring and coastal decor. Five bedrooms, four bathrooms, a live-in sized great room opening to a chef style kitchen and a 3-car garage are just the beginning. Bayshores includes two private beaches, small boat storage, sand volleyball, beach barbeques, children’s play park, private access gate to the Balboa Bay Resort, two nearby yacht marinas and year around community activities. Proudly situated on an elevated, extra-wide 45-foot lot in the coveted 300 block of “Flower Streets” this property affords easy access to shopping, restaurants, beaches and award-winning schools. Due to its unique elevation and eastern exposure, homeowners will enjoy breathtaking sunrises above Pelican Hill and the warm glow of classic Southern California sunsets against the hillside homes above. Offered for sale for the first time in 45 years, this is not an opportunity that presents itself often. Don’t miss your chance to write the next chapter for yourself in Corona del Mar Village. One of the few homes in the Cays with unobstructed northfacing views of the bay. A dock that is able to fit a boat up to 75â&#x20AC;&#x2122;. Master suite is located on the lower level of the home with a large walk-in closet, 5-piece bathroom, and fantastic 180-degree views of the bay. Grand backyard to entertain guests with a gazebo, sauna, and full bathroom accessible for outdoor parties. A newly constructed deck patio off of one of the three bedrooms located upstairs sharing the same views. This ocean view home is a treasure to behold. Refreshed and redesigned four bedrooms, 4 bathrooms, contemporary style with nearly 3,600-square feet of single-level living space. Highly upgraded with immense attention to detail that accentuates its sophistication and the comfort of coastal living. Open flowing floor plan with a beach vibe provides a great room environment with ocean views and abundant natural light, all opening to sizable front patio and spectacular ocean views. The largest floor plan in the desirable Coastal Canyon community sited on a private, end of cul-de-sac, oversized lot with canyon and ocean views. This 4,288-squarefoot coastal home hosts the perfect layout, featuring a courtyard entry with detached casita. Wrapping around the sides and back are expansive terrace spaces with lanai, fire pit and open yard space. An open interior floor plan features a large gourmet kitchen with professional grade appliances, spacious gathering rooms and mainfloor bedroom suite. A light infused contemporary with a Mediterranean exterior offering fabulous views of the hillside, golf course and peek ocean views from the master bedroom balcony. Wonderful smart home technology and architectural lighting detail features the latest in style and technology. Offering five en suite bedrooms, a media room, expansive yard, pool and spa, the home is a wonderful blend of comfort and elegance that welcomes you to each room. With easy access to the clubhouse and the privacy of culde-sac living, this estate is the epitome of luxe living in the community of the prestigious Del Mar Country Club. A rare opportunity to own one of the largest lots. Unobstructed, sweeping, panoramic views of San Diego Bay, Downtown, Coronado & Mexico! The enormous lot covers nearly 1/2 an acre, with the possibility to build two homes or the home of your dreams in one of the most sought-after locations. You have the chance to build a large dream home or even look into the possibility of splitting the lot. The home is very private but the location is very central with easy access to San Diegoâ&#x20AC;&#x2122;s airport, downtown, beaches and the bay. 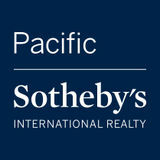 Walking distance to the San Diego Yacht Club, Point Loma Village, Shelter Island, shops and restaurants. Magnificent newly custom-built home perfectly situated in the heart of Coronado Island, located on a prime corner just steps to world-famous Speckles Park and a public library. Walk two blocks to award-winning schools, watch 4th of July Parade and fireworks, famous summer Concerts in the Park and beautiful sunsets from your large terrace or front porch. Walking distance to local shops, restaurants and the Village. The Park at Bankers Hill offers elevated living and unrivaled luxury. Fluidly blending indoor and outdoor living, the oversized terraces offer views of the majestic canopies of Balboa Park or the downtown skyline. Direct access elevator opens into the approx. 2,875-squarefoot, 2-bedroom with a den residence featuring two large balconies, one with marble-surround fireplace. Exclusive community features resort-style pool/spa, entertainment lounge and club bar with TV, fitness center, yoga room, wine room with storage locker and billiard table. Quintessential turnkey beach cottage in desirable lower Three Arch Bay. Chic, stylish and highly upgraded, this jewel of a home exudes coastal charm and close proximity to the beach access and amenities in this idyllic private community. Bright, open living room has French doors to the outdoor deck. The gorgeous chefâ&#x20AC;&#x2122;s kitchen/dining area are adjacent to the living room and formal dining room with ocean view. The master suite features a stunning master bathroom with finishes that rival a 5-star resort. Refinished hardwood floors, voluminous wood-beamed ceilings and a tasteful color palette enhance the beauty within this quiet seaside sanctuary. Island beach house three houses to the sand with ocean views from the deck. Gorgeous and updated with warm wood floors, open concept living area, master bedroom with vaulted ceilings and plenty of outdoor living spaces. Includes a guest suite over the one-car garage. A rare find on one of the quiet streets near the ocean. This property situated on the coveted private beach in Coral Cay affords timeless elegance and sophistication in a charming and exclusive gated community. Pristine landscape, tennis courts, personal docks and private beach access make Coral Cay unique. This gorgeous home boasts over 3,300 SF of living space, including a main-floor bedroom, two upstairs guest rooms and a striking master retreat with exceptionally spacious en-suite and walk-in closet with bold views of the water. This home showcases bright white interior with floor-toceiling windows, illuminating the living space. Character and charm overflows from this rare beachfront home. In true “cottage by the sea” fashion, this property rests on the sand in Sunset Beach. The traditional and classic design of this home boasts warm wood floors, a spacious galley kitchen, a family room and a living/dining room looking out onto the sand. Upstairs, discover a master retreat with floor-to-ceiling windows overlooking the Pacific Ocean just outside. Two additional spacious bedrooms and a full bath round out upstairs. This home is situated on an ideal lot and offers a detached two-car garage. Expertly customized and highly refined, this singlelevel residence presents the “New Vibe” in the Cortile Collection at The Bridges premier gated golf and tennis community. Four ensuite bedrooms include an expanded master suite with immediate access to the pool and spa, and a 2-bedroom, 2-bath casita. Outdoor features include an array of patios and courtyards, a crystal-blue fire ring, an outdoor string-lighted dining pavilion and a fashionable kitchen and bar. The attached oversized 3-car garage and additional covered car cabana accommodate ample parking. Highly upgraded Hunt Club estate with stunning panoramic views and resort-style amenities. The timeless architectural style marries contemporary design elements to savor indoor/outdoor living and entertaining. The impressive backyard showcases a saltwater pool/hot tub and a wellappointed outdoor kitchen/bar/grill adjacent to a spacious loggia with built-in heaters, TV/outdoor sound system, ice maker and fridge. Additional upgrades include drought tolerant turf, 1/2 court bball, fire pit, solar panels and so much more. Contemporary waterfront duplex overlooking the sand, beautiful sail boats in Mission Bay and the iconic Mission Beach boardwalk. Offering two separate 2-level homes with 4-car parking and a boardwalk-front patio, this property gives way to 6-figure income from vacation rentals and also allows for a family compound or the versatile option of living in one home and using the other for income as well.